For project information on how Wikispecies relates to English Wikipedia, see Wikipedia:Wikispecies. Wikispecies is a wiki-based online project supported by the Wikimedia Foundation. Its aim is to create a comprehensive free content catalogue of all species; the project is directed at scientists, rather than at the general public. Jimmy Wales stated that editors are not required to fax in their degrees, but that submissions will have to pass muster with a technical audience. Wikispecies is available under the GNU Free Documentation License and CC BY-SA 3.0. On January 7, 2017, the project reached 500,000 articles. On October 30, 2018, the project reached 600,000 articles, and a total of 1.12 million pages. 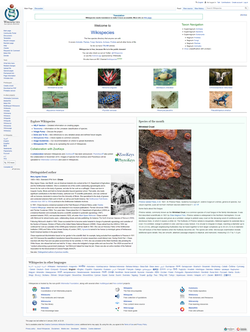 Wikispecies comprises taxon pages, and additionally pages about synonyms, taxon authorities, taxonomical publications, and institutions or repositories holding type specimen.